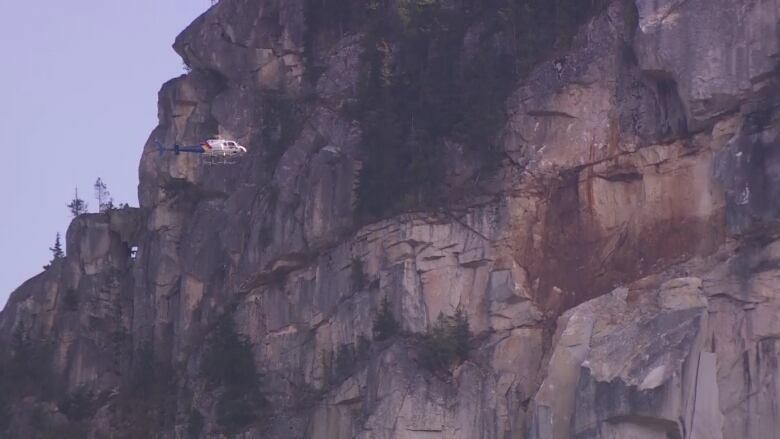 RCMP in Squamish say the north face of the Stawamus Chief is still too unstable to properly search the rubble below for anyone who may have been caught in a rock slide. 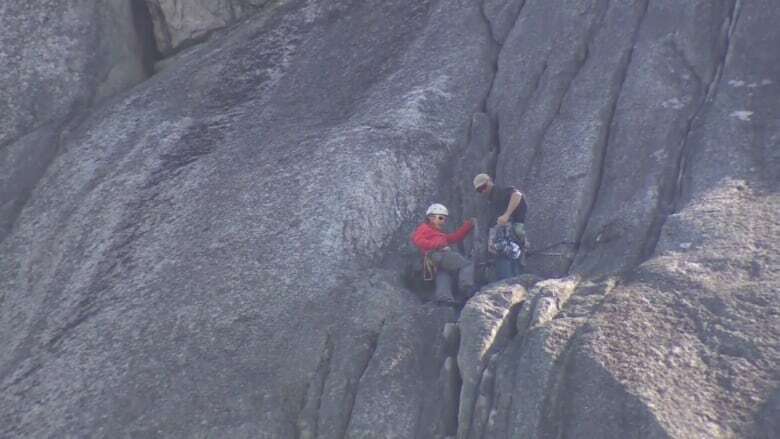 RCMP in Squamish say the north face of the Stawamus Chief is still too unstable to properly search the rubble below for anyone who may have been caught in a rock slide on Sunday. The slide happened just before 12 p.m. PT when what police describe as a 1,000 cubic metre granite slab fell away from the mountain in the North Walls area of the north peak, near a climbing route called Northern Lights. "The sound was incredible," said local resident Kirsten Andrews who watched the slide from her home just kilometres away. "It was terrifying." She posted a video of the slide in progress, complete with sound, to her Facebook page. "I pray no one was there," she added. Police don't believe anyone was caught in the dramatic slide. So far no injuries or property damage has been reported and RCMP officers have accounted for four climbers who were in the area when the slide began. "We have no intelligence to suggest at this time that there is anyone trapped there," said RCMP Insp. Davis Wendell. "But in an abundance of caution we're doing everything we can to eliminate that possibility at this time." 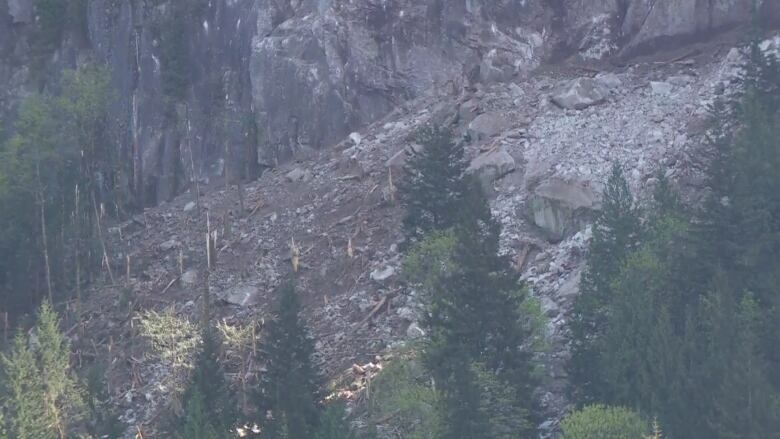 "What we are looking for now is anyone who has any knowledge of anyone that was hiking there, bouldering there or climbing there ... to please contact the Squamish RCMP." A geotechnical engineering assessment has been done. Although the results have not been released, police say the assessment determined that the rock face is too unstable for emergency responders to go into the area. Wendell said it could be weeks before the area is deemed safe but added that more assessments are currently taking place. The slide is the second emergency to hit the district this week. On Thursday April 16, the creosote timbers of a dock at Squamish Terminals caught fire, causing thick black smoke to billow over the municipality. On Sunday, an air quality advisory in the area was lifted even though the fire continues to smolder. "We've been going full tilt in our emergency operation centre," said Squamish Mayor Patricia Heintzman. She said she's hopeful that no one will be found injured by the slide and is thankful it happened in an area of the Stawamus Chief that does not attract many people. "This particular area is really only for highly skilled rock climbers, not your more tourist-orientated climbs," she said. Heintzman is not surprised by the rock slide and remembers a similar incident a decade ago, but admits that many residents believe the mountain to be stable. "This is a granite mountain, so from a climbing perspective it's actually a pretty solid mountain, episodes like this are fairly infrequent, they're fairly rare." There was no impact from the slide to Highway 99. However, Mamquam Forest Service Road has been closed at Highway 99 and at Cherry Drive.